THANK YOU TO EVERYONE WHO WAS INVOLVED IN THE HACKNEY WICK FESTIVAL!!!!!! This was the 1st time that Leabank Square had a massive festival - and it was greatly enjoyed by EVERYBODY!! The sun came out, the visitors came in, the residents loved & laughed, the kids went crazy, the music played, the bouncy castle rocked, the rowing boat cruised - but most of all - we ALL made new friends from our neighbours!! Tracie has come up with an absolutely beautiful idea!! 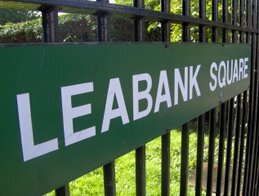 Create a lovely Leabank Square mosaic mural in the square on the day of the festival!! To do this - she needs as much old crockery as possible. 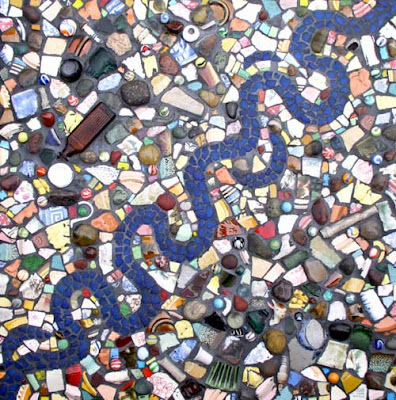 So if you have any old cups, saucers, plates, mirrors, tiles, sequins, mugs, - in fact anything hard, durable & colourful that can be smashed up into smaller pieces - and stuck into wet cement!! Check out your cupboards - is there anything chipped, stained, mismatching - or just too unfashionable - please bring it along to the Riverside wall on the Leabank Square Festival day - Saturday 27th September - as if you didn't know the date off by heart already!! I just wanted to share these pictures with you all - so it's pouring down with rain and Sóna is worried that the bags aren't getting enough water! A truly dedicated and passionate Gardener!!! Thank you Sóna, for all the colour and warmth you have brought to Leabank Square. Your endless efforts in brightening up the Square have really proved that so much can be achieved with a little belief and a lot of energy!!! Mabley Green Adidas Outdoor Gym!